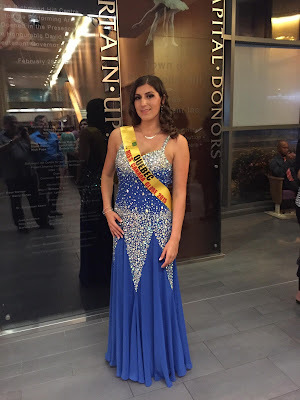 Dollard des Ormeaux’s Ashley Sahakian recently returned from Toronto and the Miss Canada Globe Pageant where was crowned Miss Quebec Globe. Miss Canada Globe Productions was founded in May 2000 and has three distinct divisions: Miss Globe, Miss Petite International and Miss Teen Worldwide. The vision of organizers is to recreate the glamour of pageants, with a stronger focus on education and equality. Pageant titleholders are not limited to a specific height or cultural background. The goal is for candidates to gain the confidence and poise that can be applied to their personal lives and careers in order to advance in today’s competitive society. A total of three competitors were from Quebec, with Ashley finishing first regionally. “We had long days of walk training and dance rehearsals,” she explains. “We also had hair and makeup training followed by personal interviews. From there we competed for regional titles on stage in swimwear and evening gowns." There was an interview and platform speech for the national competition. Ashley chose to talk about the Starlight Children's Foundation “because I found that what they do is simply incredible. Every child deserves to have a life full of fun and be able to just be kids without having to struggle greatly from illness and Starlight makes this happen.” Besides her regional honours, Ashley also finished among the top 10 nationally. Ashley is currently recruiting girls for next year. She can be reached at ashleysahakian@hotmail.com.